The Athabasca United Church is an early twentieth century one-storey wood frame structure located on a sloping, double corner lot in the Town of Athabasca. It features twin corner towers of unequal height, pointed arched windows, and a gable roof. The heritage value of the Athabasca United Church lies in its association with the growth of Athabasca prior to World War One and its Gothic Revival architecture. Founded as a Hudson's Bay Company (H.B.C.) post in 1875, the settlement at Athabasca initially developed as a vital transportation hub for the fur trade and the Klondike Gold Rush, connecting traders and prospectors with a vast land and river network extending into Northern Alberta and the Western Arctic. The community's transportation system was further developed in 1912, when the Canadian Northern Railway (C.No.R.) completed construction on the Edmonton and Slave Lake Railway to Athabasca. A land rush ensued the following year as settlers attracted by the area's abundant land and resources - especially natural gas - boarded trains and flocked to the town. The heady optimism of the times is evident in the large-scale of the Athabasca United Church (originally the Athabasca Methodist Church) built in 1913. One of Alberta's largest frame structures with a capacity exceeding 600 people, the church was built at the height of hopes for Athabasca, before railway lines bypassing the settlement brought the town's rapid expansion to an abrupt halt. Adapting the Gothic Revival style of architecture to the particular needs and sensibilities of the community in Athabasca, well-known Edmonton architect Ernest William Morehouse designed the Athabasca United Church as an elegant, spacious building. The Gothic Revival style in evident in the twin corner towers, the trefoil gable window, and the pointed, arched windows. The church resembles other Protestant houses of worship in Alberta derived from the Gothic Revival style, but is distinguished by its use of wood as the primary building material and its roof supported by walls, rafters, and ceiling joists without any interior pillars. The plan of the church, with its many windows and almost square design, was intended to create an atmosphere of spaciousness and grandeur centred on the preacher proclaiming the Gospel. - incidental Gothic detailing, including wood trefoils in gable ends. The Athabasca United Church (Methodist before 1925) was built in 1913 at the height of Athabasca's strategic role as a gateway to northern Alberta and the western Arctic. 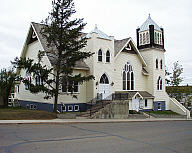 As it grew to prominence in Northern Alberta, Athabasca was closely associated with the activities of various churches. Unlike the Anglicans or Catholics, the Methodists brought no missions to Athabasca during the fur trading era. After the turn of the century, when agricultural settlement prompted a growing resident population of businessmen and farmers, the Methodist Church purchased land in 1904 for a church and parsonage. A resident minister named Hopkins was called to Athabasca in 1907. Hopkins, who was also a carpenter, built a hall for church services. In 1910, Hopkins left Athabasca Landing to establish a Methodist church in Grand Prairie. Following Hopkin's departure, the increasing demand for Methodist clergy was filled by Reverend Ernest Haywood and Reverend T. Bole. The new church building was constructed during the tenure of Reverend Bole, while Athabasca was thriving. The church is a unique example of a large scale (seating 628 at capacity), wood frame structure in the Gothic Revival style, loosely adapted to a plan frequently employed by adherents to certain Protestant faiths (Methodists, Baptists, Presbyterians, Congregationalists). Perhaps its most important feature is the ambitious use of wood as the primary building material, in lieu of brick and/or stone. Frame construction was undoubtedly necessitated by financial consideration, but it did not hamper the imitation in wood of the brick or stone Gothic Revival churches of larger western Canadian cities. Despite its size, the roof is supported by the walls and a system of rafters and ceiling joists without any interior pillars.